If you're a Regular Reader of my Blog you'll know I like to make you all Question, and look into whatever went before to Challenge to see Information in new ways. While the concept I'm going to talk about is not new, but I will to make you think about how you apply to your own needs. As always this about High Performance, and you will Burn Fat while Building Strong Functionally Strong Body. I'm sure you've all heard about the Afterburn Effect? Or to be correct its right Scientific Name Excess Post Exercise Oxygen Consumption, Right? 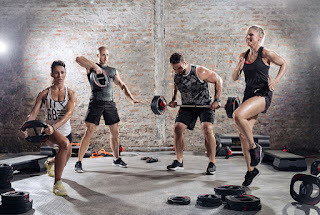 To put this in a very simple way this is when your Body continues to Burn Calories at a Higher Rate than normal following Intense Exercise through an Increase in Oxygen use after Exercise. However to make full effect of this we need to Consider the Body accross all levels not just manipulating Cardio to produce EPOC which is easy to do, and it does not fully Condition the Body. What I'm going to show you are "Three Keys" on how to Use the most Effective Ways to Produce the Highest Afterburn while remaining Functional, Injury Free and able to Perform. During this Article you're going to use one of go to Methods on this Site Military Circuit Training to Maximize Intensity and Functionality for Performance. 1:Reach Maximum Heart Rate during you Session. You can have Periods of Rest but you must have Periods at Maximum Heart Rate. 2: Use as much Muscle as Possible through Different Movements. 3:Work your Core Every Session. It is manipulating these 3 Key areas that will give you a Strong, Funcational and Robust Body. The Methods I'm about to show you are the Three most Effective for Increasing AfterBurn Effect. On their own they will not be new to you unless you're a Beginner with no knowledge at all. However I will make a Brief outline of the Tools before I go into more Details. I'll then provide One Example of these, and move on to the Circuits I want you to use for Maximum Afterburn Effect. 1)Interval Training:This is Simply Alternating Periods of Work and Rest to affect the Intensity of Training over a Period of the Workout. These can used to develop almost ANY aspect of Conditioning. 2)Super Sets:There are lots of different Types of Super Set, but for Simplicity the basic Definition is using One Set of Two Exercises without Rest before resting for the next Super Set. For Example Barbell Back Squat, and Set of Press Ups immediately following. You would then Rest, and Repeat the designated number of Sets. This is called the "Killer" for Very Good reasons, and if you're doing it right you'll find out why too. -Repeat this until you've Completed 5 Runs. That's all you need, and if you've Run it Hard Enough you'll feel it. You can see the Pattern is to avoid working Super Setting Upper and Lower Body if you can. Of course Abs can also be mixed into this. Doing any one of these Combinations will increase your Heart Rate, Impact the most Muscle, and increase the Afterburn Effect. Part 3- Abs Circuit:choose 3 Abs Exercises of Choice Perform 20 Reps of each followed by 2 minutes of Step Ups. Repeat this 3 times. So now I've given you the Template, now how many Ideas can you come up with? Play with the Exercises, Reps, Variables that's the Beauty of the Template. You will know you've done this right because you'll be feeling Sick at the End of each Session..
For more Information or for a Personal Program Contact Me Via the Site.